Dr. Randall Bishop grew up at Noggins Corner Farm in Greenwich, NS. Summer Sundays were a day off from farm chores and were spent swimming, fishing, sailing and waterskiing at the family camp at Aylesford Lake. In his earlier years, he and his siblings won, on several occasions, the Canadian National One Design Regatta, held annually at Aylesford Lake. Dr. Bishop graduated from Horton High School and then attended the Nova Scotia Agricultural College in Truro, N.S., driving home most weekends to help on the farm. Upon completion of his DVM degree from the Ontario Veterinary College, University of Guelph in 1979, he immediately began working at Cornwallis Veterinarians Ltd. Along with his wife, Dr. Sandra Simms, Dr. Bishop became a Director of Cornwallis Vets in 1981. Poultry health is Dr. Bishop’s specialty and he’s frequently sought after for his expert opinions and skills. He also works with fur-bearing industry as well as some food producing animal and equine practice. 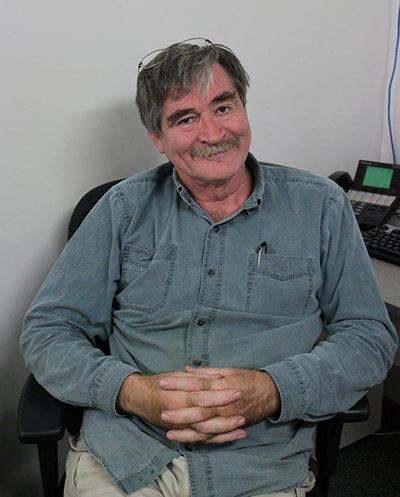 Dr. Bishop is the IT guy and jack-of-all-trades at Cornwallis Vets, perhaps because of his formative years on the farm. Music is Dr. Bishop’s passion and he plays trombone and tuba in at least three different bands. In his “spare time” he always has construction and renovation projects underway but he still enjoys the summer cottage activities and throws in a bit of snowboarding, ballroom dancing, fixing and driving his TR3 and travel on the side. Dr. Bishop has been a member of the Rotary Club of Kentville since 1990 and was club president during 1996-1997. He is also a past-president of the Nova Scotia Veterinary Medical Association. Dr. Bishop and Dr. Simms have four wonderful children and one beautiful grandchild with another expected in December 2018.